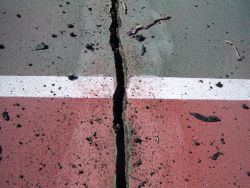 Crack Repair | ProSport Construction, Inc. The RiteWay Crack Repair System (U.S. Patent No. 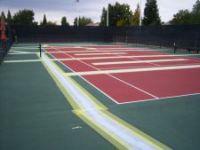 7,597,503) utilizes a micro-technology that allows the existing cracks on your court to move without breaking the membrane of this system. Many who’ve tried other systems have complained about “dead spots,” “hollow sounds” and “bubbling.” RiteWay Crack Repair not only keeps cracks from coming back, but its Micro Sealant® technology has NO dead spots, hollow sounds or bubbling. Installed by a certified RiteWay contractor, this system will save you thousands of dollars over time. 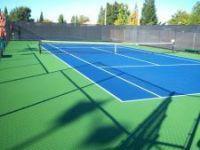 Traditional methods leave unsightly repairs each year – RiteWay will keep your court looking new and playing safe year after year, without having to wait in the spring for yearly repairs to be completed. 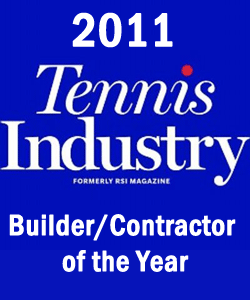 No other overlay system can give you RiteWay results – or guarantee. RiteWay’s proven success and durability will outlast our competitors. When considering your repair options, there’s only one question to ask yourself: are you repairing cracks the old traditional way – or are you repairing them the RiteWay? See below before and after images.